Behind the mule there was a camel, with his big soft feet squelching and slipping in the mud, and his neck bobbing to and fro like a strayed hen’s. Luckily, I knew enough of beast language — not wild-beast language, but camp-beast language, of course — from the natives to know what he was saying. “About as much as we feel inclined to sit down and let men sprawl all over us, or run into people with knives. I never heard such stuff. A mountain ledge, a well-balanced load, a driver you can trust to let you pick your own way, and I’m your mule. But — the other things — no!” said Billy, with a stamp of his foot. “The man who walks at your head — Or sits on your back — Or holds the nose rope — Or twists your tail,” said Billy and the troop-horse and the camel and the bullocks one after the other. “They — eat — us! Pull!” said the near bullock. The yoke snapped with a twang, and they lumbered off together. I never knew before what made Indian cattle so scared of Englishmen. We eat beef — a thing that no cattle-driver touches — and of course the cattle do not like it. The rain began to fall again, and for a while it was too misty to see what the troops were doing. They had made a big half circle across the plain, and were spreading out into a line. That line grew and grew and grew till it was three-quarters of a mile long from wing to wing — one solid wall of men, horses, and guns. Then it came on straight toward the Viceroy and the Amir, and as it got nearer the ground began to shake, like the deck of a steamer when the engines are going fast. I’ve gotten really lucky with the days I post things on this year! I’m posting this in honor of Rudyard Kipling’s birthday (which was yesterday, December 30th)! I’ll be posting something special for Jacob Grimm on January 3rd (his birthday’s on the 4th). For new fairy tales, Prince of Prophecy, and Writer’s Corner updates every Wednesday and Saturday, follow this blog! Well, folks, a new year is once again upon us. This year wasn’t too bad for me, but I hope next year will be even better for all of us! I’m getting ready for the launch party of my second book, The Prince of Prophecy Vol. II: Cursed, which will be held on Saturday (January 3rd). I just received the books for the party today—I feel like I really cut it close with that—and now everything’s ready to go! I’m super excited about this launch, and I can’t wait for people to read this second book—it’s really action packed and full of surprises! I’ve already begun working on my second book series (it’s a sci-fi/fantasy/adventure series), but I do plan to take some time this month to catch up on some long neglected video games that have been collected dust on my shelf for two years while I was writing the Prince of Prophecy series. I’ve got to work in as much fun as I can before I start school again in February! I’m going to be opening up Etsy and Cafepress shops soon for cool Prince of Prophecy merchandise. I might even get back into sewing and crafting if I have time during the next year. However, I know that 2015 is going to be really busy. I’ll be releasing my third book in the Prince of Prophecy series in June of 2015, and the fourth book in December of 2015—so yeah, my plate’s super full. 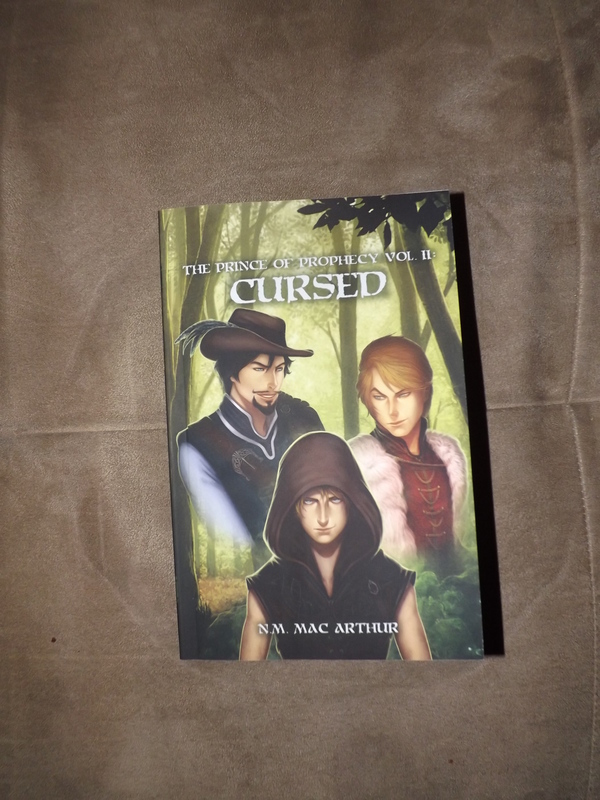 “Cursed” is available for purchase!!!! There will be more links to come in the weeks to follow! Trust me, you don’t want to miss out on this action packed sequel–things get really exciting and there’re fun new characters to get to know! Months after his encounter with the Snow Queen, Destan finds himself longing for adventure once more. Word has spread about his triumph over Queen Isole, and everyone is calling him a hero—a wonderful achievement if only Destan believed that too. With the pressure of the crown looming closer with each and every day, Destan wonders what it would be like to cast aside his royal life and pursue the adventures that he longs for. Perhaps then he could prove to himself that he is truly a hero worthy of recognition. When his devious cousin returns with an olive branch and a new court magician, Destan’s dream of a different life becomes a reality. However, like most magic, his wish comes at a precious price. In this frightening new world filled with suave mercenaries, obsessive witches, and blood-thirsty ogres, he can’t be sure who he can trust—not even the people he used to call friends. Destan realises—a little too late—that he should have been more careful about what he wished for. On a separate note, I’m returning to my regular schedule (fairy tales, poems, classic literature, and Writer’s Corner stuff) on Wednesday, December 31st! I hope you all enjoyed The Prince of Prophecy’s Christmas Carol–I think it was a fun little detour from the usual. 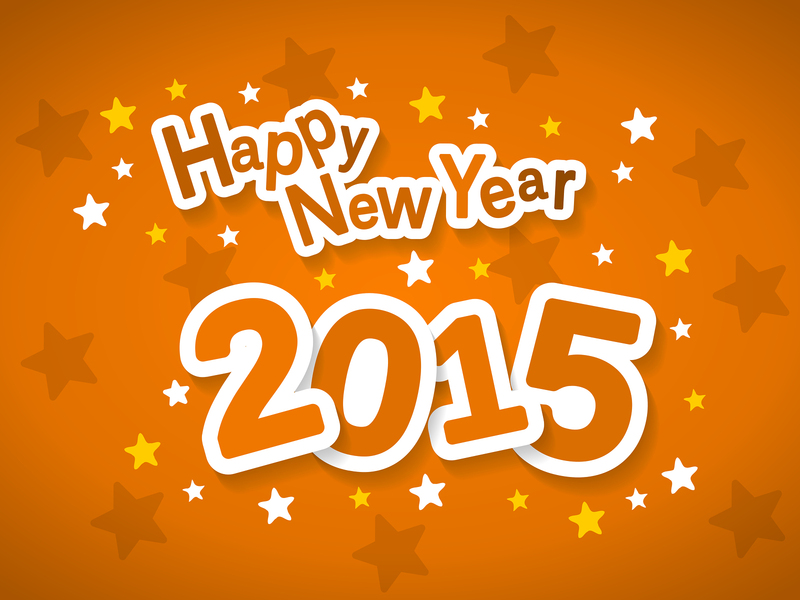 I can’t wait for all the good things that I’m sure 2015 will bring, and I wish you all a very prosperous new year! Destan’s eyes shot open and he found that he was laying, not in his soft, warm bed, but on the cold, hard ground. He wasn’t even in his room! He was outside in what looked like the palace gardens. Mist like rain fell from the cloudy, grey sky above, covering his robe in a coat of glistening beads. What was he doing out here? Had he sleep walked? Where was that chiming coming from? There was certainly no clock out here, and it sounded too close to be from the church bells in Gründorf. Destan wiped the moisture from his face, slowly sat up, and nearly jumped out of his skin at the sight before him. There was a figure in a black coat standing before him. The figure was wearing a hood that hid its face from Destan’s view—he was not sure if he was glad for it or not. The figure gave one slow nod in response. The phantom nodded gravely once more. It then gave an exaggerated sigh and removed its hood to reveal the face of a striking young man with short, perfectly disheveled raven hair and brilliant blue eyes that glimmered with an amusement that was inappropriate given the solemn circumstances and setting. The man looked to be no older than twenty and had meticulously groomed facial hair. Now that his hood was down, he didn’t look nearly as intimidating as he had before. “It would seem so,” the ghost nodded. “The other spirits that I met I at least vaguely recognized, but I’m quite certain I’ve never seen your face before,” Destan explained. Destan pulled his robe more tightly around himself—his short legs struggling to keep up with the quick spirit. All I want for Christmas is a ten more centimetres… he thought glumly to himself as he and the ghost traipsed up the terrace steps and entered Rosenstaat Palace. The palace hallways were dark and silent. No colourful decorations hung on the walls, and there were no servants merrily humming Christmas carols as they went about their work. Was the palace abandoned? The spirit smirked, though his expression lacked malice. He grabbed hold of the prince’s arm, chuckling softly. “Don’t you let that pure heart of yours break just yet, Blondie. I haven’t even shown you the best part!” he said, forcefully tugging him down the hall. Destan got the distinct impression that by ‘best part’ the ghost wasn’t talking about something nice. The ghost led him through the palace, past miserable looking servants and staff, and eventually they found their way to the resident wing. Destan tried to tug his arm out of the spirit’s grasp, but he was too strong. The prince felt the blood drain from his face as they approached the king’s chambers. “Please! I’ve seen enough! I don’t want to know any more!” Destan cried desperately. “Maybe, maybe not. I guess we’ll see after this, ey?” The spirit winked before throwing him through the door and into the king’s chambers. Just as before, Destan sunk right through the wood as if he too were merely an apparition. He caught himself before he could fall to the ground and quickly composed himself. The room was dark and the drapes were drawn. The only light in the large room came from the dying flames in the fireplace. At the back of the room, beside the balcony doors, sat man in a dressing robe hunched over a desk. His left elbow rested on the surface of the desk whilst the finger of his left hand curled into his mess of short, golden coloured hair. He didn’t move, or sigh, or anything to signal that he was even awake. Destan cautiously made his way over to the desk and leaned forward to look upon the man’s face. He looked familiar—he looked like Klaus. But, unlike Klaus, there was no vibrancy in his features. His blue eyes were dim and stared listlessly down at the desk, his long dark lashes nearly shielding his irises from Destan’s view. “Brooding? Dark? Mysterious?” the spirit offered. The bedroom door burst open and Destan jumped in surprise, though his older self didn’t even flinch. A beautiful, but furious looking woman stormed into the room, her light brown eyes absolutely livid. She paused just behind older Destan’s seat, took a deep breath through her nose, and haughtily pushed his wavy, dark blonde hair over her shoulder. Destan cringed. That’s Klara? So I do have to marry her after all… he thought glumly to himself. Klara’s red lips parted as if she were going to say something in retort. However, seeming to think better of it, she shut her mouth just as the tears began to stream from her eyes. She turned on her heel and hurried out of the room, slamming the door and leaving the scent of jasmine and ambergris behind her. The king shut his eyes tightly once more, swallowing as a single tear rolled down his cheek. The spirit leaned casually against the wall beside the desk, examining his fingernails. “Don’t you mean, ‘how could I’?” the ghost asked. The spirit’s bright blue eyes flickered towards Destan. “They’ve all left you. They’ve cut you out of their lives. Can’t say that I blame them—I mean, just look at him! Who’d want to be around a sad sack like him, anyway?” the ghost asked, motioning towards the broken king. Destan’s gaze darted between the ghost’s hand and the shadowy face that hid beneath the spirit’s hood. He was grinning again, but Destan could not tell if it was sinister or friendly this time. After a long moment of weight his options, Destan hesitantly reached out and grasped the spirit’s hand. I don’t want this future. I … I want to change. The room around them began to swirl and blur into incomprehensible shapes and multitudes of colours. When the swirling finally stopped and the world came back into focus, Destan saw that they were standing in the palace gardens yet again. However, this time, the gardens were covered in a fresh layer of snow and pretty, white flakes drifted down from the heavens above. Destan turned his face up towards the sky, feeling icy snow flakes land upon his cheeks. As the spirit started off down the path, Destan hurried after him, his slippers crunching in the freshly fallen snow. All was quiet between them as the spirit led Destan up the path and into a familiar rose garden. The plants were an ugly, dead brown, and there was not a single white bloom in sight. This wasn’t right. His mother’s rose garden always thrived, even during the harsh winters that Rosenstaat used to have. That’s when he noticed the stone casket. It was covered in a thin layer of snow and the area around the casket didn’t appear as if many people had been to visit—there were only two sets of footprints, not including his and the spirit’s. A single pink rose, tied with a white ribbon sat atop the casket. It looked fresh as if someone had only just been there to drop it off. Other than the rose, there appeared to be no other signs of memorialization. Destan reached out with a shaking hand and set it atop the tomb. “Is this…” his voice trailed off, as if the rest of his question was carried away in the gentle but icy breeze. “Earlier this morning,” said the spirit. The prince’s heart sank into his stomach. If that was the case, then his funeral must not have been very large, for there were only two sets of tracks leading to and from this place. He gingerly picked up the rose and examined it carefully, wondering who had been kind enough to pay tribute to such a horrid wretch like himself. “So this is my fate? I am to die alone with only one kind person to pity me?” Destan asked, his voice as brittle as the snowflakes that fell from the sky. The spirit didn’t reply this time, much to Destan’s dismay. The prince shut his eyes tightly before any of his tears could fall. His chest ached with some horrid pain, the likes of which cannot adequately be expressed in words. He gripped the rose tightly in his hands, feeling its thorns digging into his palm. I die alone, unwanted, and unloved … I have no one but myself to blame. I shut love out of my heart and this is the price that I will have to pay, he thought, his face contorting with agony. His body began to tremble—and it had nothing to do with the icy air. The cold that chilled him now, came from within his very being. It was a cold that no blanket could ward off, and no fire could warm. “I did,” the spirit replied easily. The ghost clasped his hands in front of him, silent once more. Still the spirit said nothing, only staring down at him from beneath his black hood. The ghost nodded and removed his hood once more to give Destan a broad smile. “It’s always been up to you, Blondie. Life is what you make it—so make it great.” He winked, and the world began to swirl once more. The next thing he knew, Destan was tumbling down, down, down, into a swirling abyss of dark shapes and shades of grey. Although, strangely, he wasn’t frightened. He felt as if the chains of guilt and sorrow that had weighed him down for so many years had finally lifted. He was free. He leaned back into the fall and shut his eyes, a relaxed smile spreading across his face. His heart was open, and he was finally ready to let love in and shut misery out. He was in control of his future, and he was going to make certain that it was changed for the better. Destan awoke to the sound of birds chirping and sunlight streaming through the parts in his bed drapes. He sat up and rubbed the sleep from his eyes. Before he had the chance to form any comprehensible thoughts, he heard the sound of his door opening and footsteps. His bed drapes were then pushed aside to reveal Florian. Destan smiled sleepily and brushed his hair out of his face. “I just woke up. Normally I would go right back to sleep on a day like this—wait! What day is it?” he asked, worry clenching his stomach. “And so I shall have breakfast with him. We all shall,” Destan said as he went in his washroom to change. “All, your highness? I’m afraid I don’t understand,” Florian called. “That’s because I’ve only just decided,” Destan said cheerily, pushing back his shoulders. The prince rode through the village’s east entrance, followed by the two carriages that he’d requested. The villagers stopped what they were doing and bowed to him as he passed by on his while stallion, Adolfis. He paused in front of the large Christmas tree in the town square and held up his hand to halt the carriages behind him. Some of the townspeople cheered, while others murmured between one another—perhaps they knew that this sort of behavior from him on Christmas was unusual. Disregarding the confused looks, Destan nodded his head, said a polite farewell, and headed further into town with the carriages following after him. He arrived in front of a familiar bake shop and dismounted his horse. After telling the carriage drivers to wait there, he marched up the steps to the shop and knocked a few times on the door, hoping that everyone was there. After a few seconds the door opened to Ida Rosamond. She blinked her hazel eyes, staring at Destan as if befuddled by the mere sight of him. “Y-your highness!” she said, curtseying to him. Destan heard the sound of chairs sliding against the floor and a moment later, Hansel, Gretel, Evie, Herr and Frau Bachmeier, and Mother Mansrot appeared behind Ida. All of their eyes—except for Mother Mansrot’s—were wide with surprise. 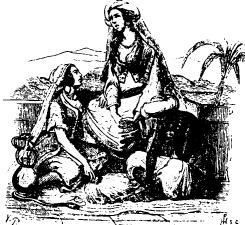 “What are you doing here, Destan?” Gretel asked. “Yes! We’ll go!” Dorothea said quickly. Ida’s jaw dropped. “And then some! This is too much, your highness, I cannot possibly accept this,” she insisted, trying to hand it back to him. “Just give us a few minutes to get ready, would you?” Dorothea said excitedly. “Take as long as you need,” Destan replied. “It would be even more like a fairy tale if there was snow,” Hansel grumbled, looking accusingly toward the prince. “Thanks, I guess,” Gerald grunted. Dorothea jabbed her elbow into his side to which he groaned. “You can’t tell, but he’s very excited, your highness,” she said with an unwavering smile. The day went marvelously, and he was able to spend time with all the people that he cared about. It was by far the best Christmas Eve that he’d had in a very long time. Now, night had fallen and the ball was in full swing. Destan sat off to the side in the grand ballroom—as he normally did—but this time he smiled as he watched his friends, family, and subjects enjoy the festivities. No bitter or sorrowful feelings arose within him as he watched everyone chat and dance—it felt good to know that he had helped to create such happiness on this joyous day. Destan’s eyes widened upon realizing that the rose Evie now held in her hand looked exactly like the rose he had seen upon his stone casket. Had she been the one to leave it there? Destan’s features relaxed and he gingerly took the rose from Evie’s grasp. He couldn’t help but smile. He knew then that no matter what happened, Evie would always be there for him. It was a wonderful feeling to know that someone who didn’t have to care about him, genuinely did. “With me?” she asked, sounding mildly surprised. Evie’s cheeks turned red as she nodded and took his outstretched hand. He led her to the middle of the ballroom and they waltzed together for much of the night, chatting and laughing like good friends do. Destan would never take his friends, family, or Christmas for granted ever again—he made this solemn vow to himself. He would enjoy every Christmas he got to spend with his loved ones, and he would cherish the love and affection he was given forevermore, because that is what this holiday is about. Thanks to the spirits, he had been changed for the better, and he hoped this change within himself would ultimately lead him to his happily ever after. I hope you all enjoyed The Prince of Prophecy’s Christmas Carol! I had a great time writing it! If you liked this short story you should check out the books (the second book, The Prince of Prophecy Vol. 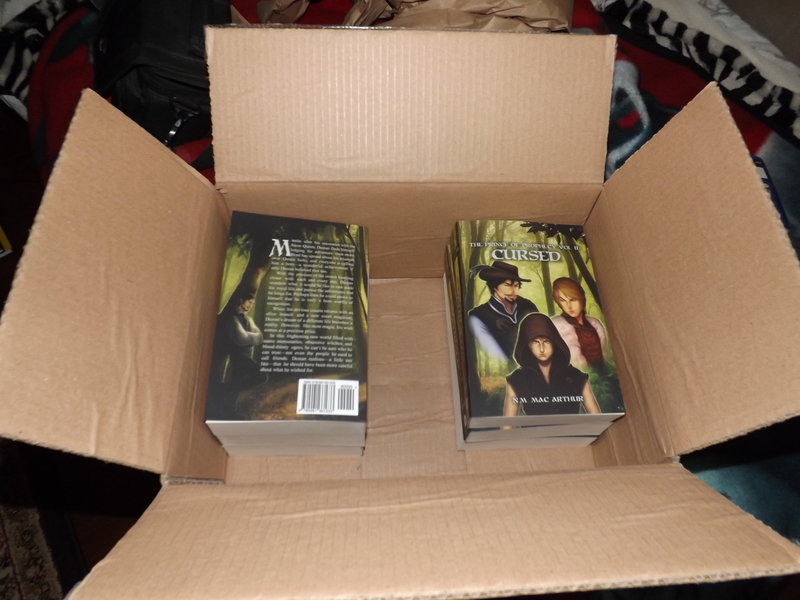 II: Cursed, will be released in paperback and hardcover on the 27th–this coming Saturday)! I wish you all a very happy holiday season! The chime rang out through the darkness of Destan’s chambers, clear and sharp. Destan’s eyes shot open, his heart beating in his ears. It was one o’ clock. He shrunk down beneath the blankets and covered his head. It wasn’t real. My father wasn’t here and there are no spirits coming for me. It was all just a dream. I’m still dreaming, he tried to convince himself. He was starting to believe these thoughts to be true … until he heard his bed drapes slide open. A bright light seeped through his covers, banishing the darkness beneath his sheets where he was curled up in a little ball. He felt the bed trembled as something took a seat beside him. He felt a hand, touch his back, its warmth penetrated the many layers of coverings he hid beneath. That single touch soothed his frantic mind and he suddenly felt compelled to peek out from beneath his covers. Destan pulled down his blankets and sat up to see the figure of a woman bathed in a calming blue light. The light she emitted was warm and gentle, and although he could not clearly see the woman’s features, he could feel that she was beautiful. “I hope I didn’t frighten you, child,” she said, her voice was soft and sweet—he felt as if he had heard her voice before. “Perhaps. Perhaps not,” she replied evasively. The prince hesitated for only a moment longer before grasping the woman’s hand. As soon as he touched her, her light grew so bright that it blinding him for one terrifying moment. When the light finally died down, they were no longer standing in Destan’s darkened chambers, but in a ballroom filled with sparkling chandeliers, finely dressed people, and a Christmas tree so tall that it nearly touched the domed ceiling above. The ball goers laughed, danced, and everyone appeared to be having a grand time. “Do you recognize this place, child?” the ghost asked. Destan nodded, smiling fondly, not at his younger self but at a handsome looking couple who stood nearby. Klaus and Kristiane, his parents, were a perfect couple. Kristiane’s wavy brown hair was pinned atop her head that night, and her bright blue eyes sparkling like precious gems in the light of the chandeliers. Klaus, who looked as dashing as Destan remember him in his blue court outfit, was whispering something in her ear as he motioned to little Destan. Kristiane laughed and kissed Klaus’s cheek taking his hand in hers. 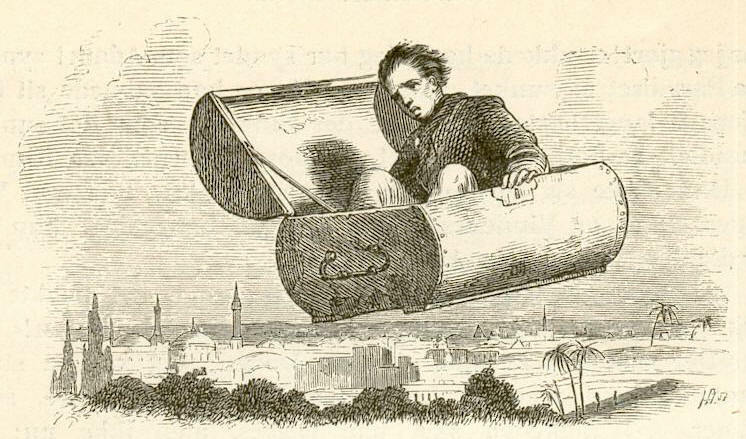 Destan felt that familiar ache in chest as he watched Klaus stoop down to pick up his son and spin him around. He could feel the happiness radiating off the family of three like beams of sunshine. They were all blissfully unaware that their time together would be just as fleeting as the Christmas season. Saying nothing, the ghost took his balled up hand in her gentle grasp and a blinding light surrounded them once more. Destan hoped that the spirit would take him home… When the light died down he saw that they were standing in a study. For a moment, he was relieved, for he recognized the parlor room as the one in the resident wing at Rosenstaat palace. He was home! However, when he turned around he saw a familiar blonde boy—no older than seven—seated beside the fire with his knees pulled up to his chest. No. He wasn’t home—not exactly anyway. That boy in front of the fire was him from six years prior. He was still in the past. “You remember this Christmas?” the ghost asked as if she hadn’t heard him. “It left a gaping wound that has never healed,” the blue woman said, gliding after him. Destan knelt down in front of his younger self, and stared into his listless blue irises. His blonde hair was disheveled and unkempt, and his eyes were dim, lacking the light children his age should have. He sat there beside the fire, still and silent, unblinkingly staring right through the present-day prince. The little boy looked tired, and his cheeks were pale and slightly gaunt. I hadn’t been eating well. I didn’t have much of an appetite after… He sighed and shook the depressing thought from his head. He was just about to demand that the spirit whisk him from this wretched place, when the parlor room door opened to reveal two familiar men: Emil Kohl and Arnold Fischer—two of King Gregory’s court advisors. Fischer wrung his boney hands as his worried gaze flickered from the little prince to his fellow advisor. Kohl motioned Fischer forward, but Fischer vigorously shook his balding head, grabbed Kohl’s arm, and shoved him ahead. The boy said nothing as he slowly shut his eyes and bowed his head. Fisher smiled nervously at Kohl and shrugged lightly before heading towards the door. Kohl rolled his eyes, grabbed Fischer by the collar and dragged him back into the room. Fischer winced as Kohl whispered harshly in his ear and lightly slapped his arm. Fischer frowned, rubbed his arm, and grudgingly trudged forward. Still, the little boy said nothing—he didn’t even twitch at the mention of his favorite dessert. The little boy set his forehead upon his knees, not uttering a single word. Kohl and Fischer glanced towards each other, the befuddled looks on their faces made it clear that they weren’t sure what to do next. Kohl sighed and nodded. “I suppose you’re right, Arnold…” The two advisors then took their leave. Now, Florian and the boy were alone—save for Destan and the spirit. Destan quickly stood up and moved away from the fireplace as Florian strolled over and took a seat in front of the little prince. The advisor crossed his legs, and studied the boy for a good, long while. The boy solemnly shook his head, his wavy, blonde hair swaying from side to side. The little prince shook his head again. “And I want you to read to me before bed,” the boy murmured. “Every night until I’m too old,” he added quickly. “Sure,” Florian said just as quietly. He lifted his hand, and, after a moment of indecision, set it on top of the boy’s blonde mane. Both the advisor and his charge were silent after that, the only sound being the crackling of the flames in the fireplace. The ghostly woman, slipped her warm hand into his and a bright light enveloped them once more. However, this time, the light did not fade away as it normally did. Before Destan could say anything more, the light faded and darkness overcame his senses. The bell tolled for the second time and Destan shot straight up. No, it wasn’t a dream. That chiming was real. It was two a.m.—did that mean the second spirit was coming? He listened carefully, but heard nothing. He looked for light seeping through the cracks of his bed drapes, but there was none. He felt no other presence in the room. Perhaps the ghosts have decided to give up on me? he thought a little too hopefully to himself. Destan scowled, feeling more irritated than frightened. What was he doing there in the prince’s room at two o’ clock in the morning? He flung back the curtains and his suspicions were confirmed. There, sitting on the couch amidst a sea of presents wrapped in brightly coloured paper and dressed with fancy gold and silver ribbons, was a man of average stature—no older than thirty—with dark blue eyes that were alight with pure joy and excitement. A holly wreath sat atop his head and a few stray strands his brown hair brushed against his brow—although, he did not seem to mind it. He wore a green robe—that looked suspiciously like a dressing gown—trimmed with brown fur and golden buttons. The man smiled brightly, jumped up from his seat, and placed his hands on his hips. Destan’s was in no mood for Wilhelm’s games. “Get out! Get out of my room this instant! If you want to visit with me, you can do so at a reasonable hour.” He grabbed the man’s arm and began tugging him towards the door. The prince rolled his eyes, continuing to pull him towards the door despite his resistance. “You don’t have that many brothers, Wilhelm,” Destan grumbled. Knowing that the spirit would not leave him alone until he did as he was told, Destan made his way over to the ghost and took hold of the furry cuff of his robe. As soon as he did, the presents, fruit baskets, cakes, pies, pudding, and delicious smelling turkeys disappeared along with his room, and a moment latter he and the spirit were standing amidst a bustling village that he knew well: Gründorf. Wreaths hung on nearly every shop and dwelling door, and red and green decoration hung in the windows. There was a great tree in the town square that was decorated with pine cones, candles, and meticulously painted wooden ornaments. When people passed each other, they tipped their hats or curtsied, wishing their fellow villagers a ‘Happy Christmas’ with genuine smiles. The ghost slung an arm around his shoulders, shaking him a little. “These bitter feelings you keep will only grow—and not only during the holiday season, but throughout the whole year. Mourning the loss of your parents can turn to resentment if you’re not careful. That is why cherishing Christmas is so important, my dear boy—embracing it will guide your heart in the right direction.” He patted Destan strongly on the back and strolled ahead of him. That didn’t exactly make Destan feel any better about it, but he followed the spirit further into town nonetheless. Soon, they arrived at a shop that Destan knew well: the Rosamond Bake Shoppe. Evie and her mother ran this place by themselves, and he very much admired them for that. The spirit motioned him forward and Destan peered through the window to see that Evie and her mother were not alone. Mother Mansrot—Evie’s Grandmother—Hansel, Gretel, and a couple he didn’t recognize where there as well, sitting around a large table. They all appeared to be chatting happily whilst eating delicious looking chocolate croissants that made Destan’s mouth water. “Come! Let’s go inside,” the spirit said, marching up the steps and passing right through the door as if it were made of mist. Destan hurried after him, though he paused in front of the door. He leaned forward to try the knob, but his hand sunk through it. In his surprise, he stumbled right through the door just as the spirit had. “But they’re talking about you! Don’t you want to hear?” the ghost asked, giving him a gentle push towards the table. The prince felt his cheeks heat up as he vigorously shook his head, but it was already too late to shut his ears. “Hansel,” Evie said with a frown. “Hey! I’m not that bad!” Hansel cried. “Oh, but it’s alright to abandon your family, is it?” Gerald grumbled. They went quiet, and Destan felt his heart sink into his stomach. “They … they gave up on me…” Destan said in a voice barely above a whisper. “Well, what did you expect after the way you treated them yesterday?” the spirit asked. Destan clenched his jaw, refusing to answer the spirit’s question. The prince took a deep breath through his nose. “No…” he mumbled. “Then what would be the harm in letting others into your heart every once in a while?” the spirit asked. When Destan looked up he saw that the scene around him was fading, and the spirit looked so much older. His hair had turned gray, his face was wrinkled, and his back was bent with age. “Wh-what’s happening to you?” Destan asked in a panic. “My time on this earth is finished,” the spirit said with an unwavering smile. “You can’t go yet! You haven’t told me how to change!” Destan cried grasping the spirit’s furry sleeve. The scene around them completely faded away and the Ghost of Christmas Present burst into millions of golden shards that flitted off and disappeared into the darkness. Once upon a time, there was a young prince named Destan Gustav Von Diederich. Destan had a very eventful year leading up to this point—a year full of adventure, new friends, and even new enemies. He couldn’t say that he had enjoyed every moment of the past year, but he had learned a lot and had managed to conquer many of his previous apprehensions. Normally, Rosenstaat was covered in a sparkling blanket of white by this time—the 23rd of December. But—thanks to Destan (it’s a long story)—it was unseasonably warm and not a single flake of snow had fallen from the heavens since his return from Queen Isole’s palace. Although this pleased Destan very much, for he had never relished in the winter season, most of his friends did not share his sentiments. 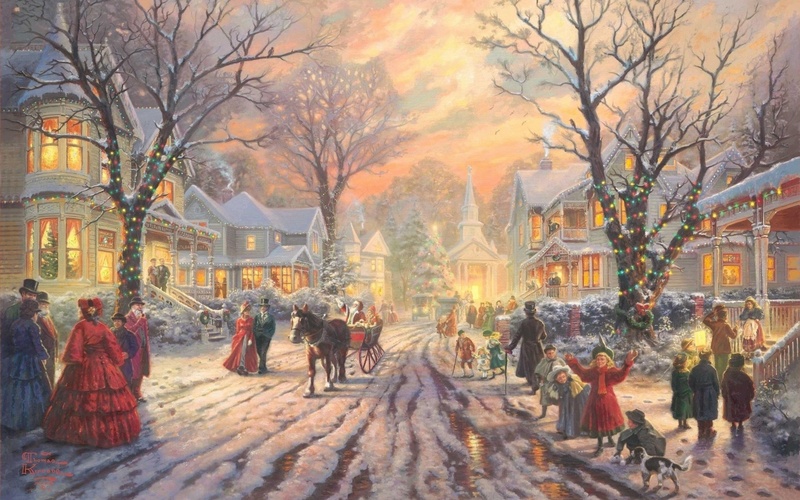 He often heard Hansel and Gretel Bachmeier complain that it didn’t feel like Christmas without snow. Evie Rosamond—another of Destan’s friends—did not utter a single word of complaint, but he could tell by her occasional sighs and her discreet looks of disappointment that she too missed the frosty, winter weather. Despite his friends’ dissatisfaction, Destan was happy that he would not be subjected to the pain that always accompanied the snow; however, try as he may, he knew he could not escape the hurt of having to face another Christmas without his parents. Klaus and Kristiane Eisenmann—his mother and father—had been dead for nearly seven years now. Although he knew he should be over it by now, December remained to be one of the most difficult times of year for him. It was true that this Christmas would be much less lonely than the previous years, as he had new friends to share this holiday season with. But, despite this, there was still a gaping hole in his heart that only his parents had been able to fill. Simply put, Destan didn’t like Christmas. He despised the wretched holiday with its false merriment and supposed ‘good cheer’. It was just an excuse to give and receive presents from people who didn’t necessarily care about each other. Luckily, most of the people who would be celebrating Christmas with him this year were genuine friends and family that he loved. Thank goodness his Uncle Philipp, Aunt Gabriele, and cousin Nicholas had decided to spare them all the discomfort of their presence this December. However, Destan was a bit dismayed at the news that his Uncle Bastian along with his new wife and stepson had chosen to stay in Wulfbach that year—he and Bastian had always gotten along very well. The only part of the guest list that made him cringe were the Gottschalks—the royal family of Östlichwald. King Lorenz, Queen Annemarie, and Princess Sophia, were not the problem—in fact, they had always been very cordial towards him. It was the youngest princess he couldn’t stand: Klara. Unfortunately Klara Gottschalks was also his betrothed—a fact that she never let him forget. Unlike his other friends who complained of the lack of snow, Klara was taking full advantage of the fair weather. He often saw her sunning in the back garden wearing a pair of dark lensed spectacles and a summer hat, with a cup of tea in one hand and a fashion book in the other. Now, as he sat beside a window in the library, he could see Klara lazily fanning herself as she and her older sister, Sophia, listened to the violin music played by one of the servants—Klara had no doubt demanded a performance from the poor man. He set his cheek on his fist as his bright blue eyes trailed away from the window and back to his work. The Latin words on the page seemed to run together into an incomprehensible jumble that was nearly impossible for his strained eyes to make sense of. How long had he been sitting at this table attempting to study? How many subjects had he gone through today? How much information had his desperate mind glossed over in attempts to fend off thoughts of his parents? Although he was well aware that this study time was unproductive, he continued at it—if nothing else, he was a very stubborn boy. “Ah, there you are,” said a familiar, genteel voice. Destan glanced up to see Florian Nachtdiener—his grandfather’s head court advisor—strolling towards him. Florian was a handsome man with olive skin—uncommon in those of German descent—and emerald green eyes that glimmered with perpetual amusement. His wavy, dark hair was held back with a ribbon which was tied at the base of his neck. “You mean to say that you would exile that as well?” Florian asked. “But that’s the point: you don’t keep it, your highness,” Florian said insistently. “No. I’m going to my room where I can be left to study in peace and quiet!” Destan shouted before turning on his heel and stomping out of the library. “Come on, Herr princey, open up!” Hansel shouted from outside Destan’s door. “You’ve been avoiding us all day. The least you can do is open up the door and let us see you,” Gretel huffed, sounding extremely irritated. “Ha ha! You just can’t bear to think of your perfect prince with a chocolate gut on him!” Hansel laughed loudly. “Gretel and Evie are better listeners than I am, just so you know…” Hansel mumbled. “Be nice, idiot!” Gretel yelled. “Ow! Stop hitting me!” Hansel yelled back. “Hansel!” Gretel and Evie cried in unison. “You can’t threaten a prince, stupid!” Gretel hissed. “Well, you could offer us a carriage back,” Hansel called through the door. After Evie said that, Destan heard the sound of three pairs of footsteps moving away from his door and down the marble tiled hallway, accompanied by Hansel and Gretel’s whispered bickering. Destan looked up at the clock on the wall above his desk and saw that it was nearly six o’ clock. Where had the day gone? It was almost completely dark outside now, and Destan vaguely wondered if he should call his friends back and offer to let them stay the night. But then he would be obligated to spend time with them despite his bad mood… He didn’t want them to see him like this. If he let them go now, chances were that he would still have friends in the morning—he could not guarantee that if he asked them to stay. In only six hours the dreaded day would be upon him: Christmas Eve. That was when he—along with the rest of Germany—traditionally celebrated the Christmas holiday. There was dancing, singing, tree lighting ceremonies, gift exchanges, and an overabundance of joy. For the past few years, Destan had chosen a quiet spot in which to sit and watch the festivities from afar. He preferred it that way. Perhaps things would be different if his parents were still alive—no. Things would be different if his parents were alive. Without Klaus and Kristiane, Christmas felt terribly lonely—it mattered not how many people had come to partake in the festivities at Rosenstaat palace. Despite how grim the thought was, Destan knew that even if his friends were present this Christmas, his loneliness and sadness would remain. Nothing would change. No one could help him feel any differently. December would forever be marred by the tragic events of his past. Destan flinched at the harsh sound of the clock’s chime. The clock sounded again and Destan’s eyes flickered open. He realized then that he’d fallen asleep at his desk. As he lifted his head, he felt a piece of paper sticking to his cheek. He peeled it off his face and stretched his arms above his head, reaching for the ceiling with a groan of discomfort. The prince scowled upon hearing the sound of the clock chiming again. Since when did he have a chiming clock anyway? He rubbed the sleep from his eyes and looked up at the wall clock. It was midnight on the dot—the 24th had arrived. The clock struck again as he was staring at it, only then did he realize that the chiming hadn’t come from that clock at all. Now that he was slightly more awake, he realized that the chiming sound seemed to be coming from the room itself. The prince stood up, his eyes flickering to every dark corner of his chambers as he tried to figure out where that blasted noise was coming from. Surely if he didn’t find the chiming’s source and stop it soon, it would wake the entire castle up. It sounded even louder this time. Destan hurried through the darkness of his chambers, tripping over chairs, tables, and strewn aside clothing, desperately searching for whatever was making that terribly loud chiming. Destan stubbed his toe on his bed post and cursed to himself beneath his breath. “Will you shut up already?” he grumbled between gritted teeth. He stumbled over a chest and looked back towards the fireplace where a fire—that he didn’t start—already blazed. It was the only light in the room and he decided to move towards it to collect his bearings—the dark had a way of disorienting minds that were already discombobulated with drowsiness. The clock sounded again just as he managed to stumble into the yellowish light of the fire. The light made his shadow long and gangly, like some sort of monster with arms and legs that looked as if they had been stretched too far. The air suddenly turned cold despite the flames that danced in the fireplace. Destan covered his ears, trying to drown out the chime, the resonance from which made the entire room tremble. What was going on? His hands did little to drown out the thunderous chime that surely woke up all the residents of the palace. The fire was suddenly extinguished and Destan was left to stand alone in the darkness of his room without even so much as a candle to comfort him. He waited for another chime, but the room was silent and deathly still—it was disconcerting for the prince to say the very least. Slowly, he lowered his hands from his ears, his eyes straining to see through the darkness as his gaze darted about the dark masses of furniture that were spread out across his room. At least, he hoped those black masses were all just furniture. He snatched up an iron poker from beside the fireplace and gripped it tightly in his sweaty palms. It was so cold—as cold as the winters in Rosenstaat used to be. Where had the draft come from? Destan cautiously looked towards his drapes and saw that they were waving slightly in some phantom breeze. He had not opened the window, he was certain of that. Perhaps one of the servants lit the fire and opened the window while I was asleep. Yes. That must be it! Although his mind was confident that this had to be the case, his body trembled like a leaf in the wind. He had not been this frightened in quite a long time—not even the mirror shard spirit had frightened him to the point of shaking. “Hello, Destan,” came the sound of male voice. The voice was echoy and had a sort of distant quality to it, but it wasn’t unpleasant or frightening. On the contrary, the voice he’d heard was warm, unlike the icy air that now coursed through the room. A smoky white figure materialized out of the darkness. It was the figure of a man who was young and strong. Although he was transparent, Destan could see clearly the handsome features of someone he knew very well. “Do you think so?” His father asked pleasantly. “You shall be visited by three spirits. Listen to what they say and learn from them, for if you do not, you may be doomed to a future full of misery and loneliness,” Klaus said in a gravely solemn tone. With those foreboding words hanging in the air the apparition disappeared completely. The fire reignited by itself, and instantly began eating away at the bitter cold. Destan’s heart beat wildly against his chest, and, for a moment, he was paralyzed in place. After taking a deep, calming breath, Destan decided to forget what he had seen—or at least try to pretend it had merely been a waking dream. He’d been overworking himself with his studies, so he supposed the idea of a ‘day-dream’ was plausible. He lit a few candles to put himself more at ease, pulled on his pyjamas, and climbed into bed. He shut all the bed drapes tightly and crawled beneath the covers, trying to rid his mind of any and all thoughts of ghosts. Soon his heavy lids shut over his eyes, and he fell into a restless sleep. Christmas is coming early, story lovers! Yes, yes, I know I missed posting all last week, but that’s just because I’ve been working on something special for you guys! That’s right! I’ve written a Christmas Prince of Prophecy short story (in the style of Charles Dickens’ “A Christmas Carol”). I’ll be uploading it in three parts, the first part of which I will be uploading today (the second part will be uploaded on Saturday, and the final part will be uploaded on Christmas Eve)! This is an exclusive WordPress short story that takes place right after my first book The Prince of Prophecy Vol. I: Destined. If you haven’t read the book, don’t fret–this short story is a stand alone that everyone can enjoy! 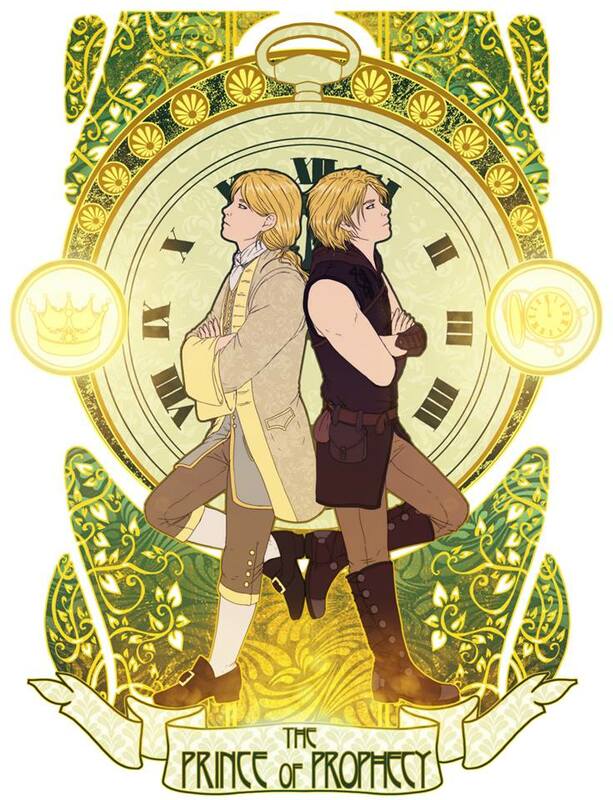 On a slightly different note, my second book The Prince of Prophecy Vol. 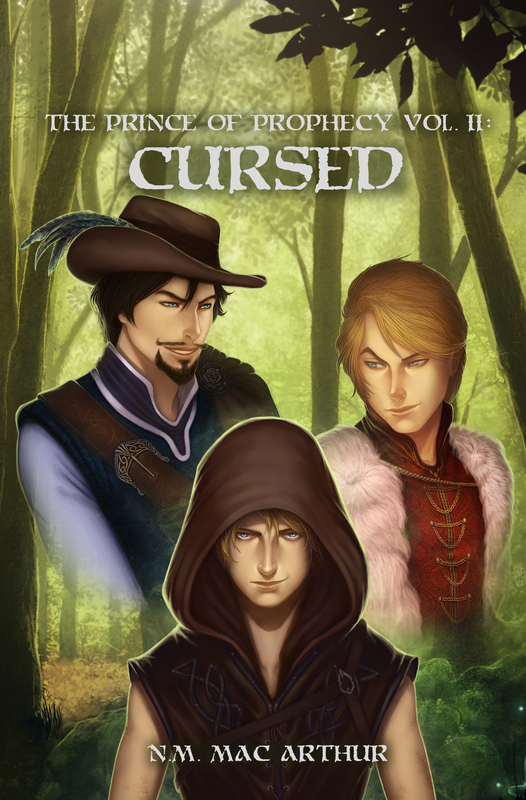 II: Cursed will be released in paperback and hardcover on December 27th–just in time to get your New Year’s read on! If you want to get the jump on this action packed sequel, the eBook is available for purchase right now on Amazon.com or B&N.com for the unbeatable prince of $2.99! I hope you all have a happy holiday season (no matter what holiday you celebrate), and I hope you enjoy The Prince of Prophecy’s Christmas Carol! his promise than she closed her eyes and died. she saw how resolved he was to carry out his intention. her father’s heart, so she determined to run away from the castle. jewel-case a gold ring, a gold spinning-wheel, and a golden hook. committing herself to the care of Heaven, she left her home. that it was fast asleep. and do all the hard work. out and presented herself at the entrance of the castle as a visitor. not seen any one pass. her face and hands, put on her fur coat, and was again Roughskin. while eating it thought he had never tasted better soup in his life. ring lying at the bottom, and could not imagine how it came there. fall into the soup; if you have, I shall thrash you!” he said. soup. “Go and send her to me,” said the King. am trying to earn my bread by helping the cook,” she replied. about the ring!” she replied. the King could not imagine what had become of her. kitchen to cook the soup. poor child, and knew nothing of the golden spinning-wheel. that she vanished from his eyes. nor hide her golden hair properly; her hands also remained white. she prepared the King’s soup, and dropped into it the golden hook. beautiful to the eyes of the King as any woman upon earth. the marriage was celebrated, and they lived happily till their death.